Intricate designs and a combination of shortbread and chocolate make GrendelSweet’s Truffle Cookies worth an order—or several. All photography by Corey Lugg | THE NIBBLE. STEPHANIE ZONIS writes about specialty food and organics. This is Page 3 of a six-page article. Click on the black links below to visit other pages. With the slogan “Chocolate is the answer. Who cares what the question is?” you have to believe that this is a chocolatier with a sense of humor, and you’re right (check out the picture of the founder on the company’s website). But don’t mistake the lighthearted approach; these are serious chocolates. They’re also not your typical bonbons. Witness the Truffle Cookies, a creamy smooth truffle atop a shortbread base, all dipped in chocolate. These are cookie-sized—you can see how large they are in the photo below, where two Truffle Cookies and a chocolate-covered apricot are teamed with an average size chocolate truffle at the top of the plate. Go for the intensely-flavored Moka, a dark chocolate truffle with organic coffee perched on chocolate shortbread, all dipped in dark chocolate; or the Black & White Raspberry, a dark chocolate-raspberry truffle with chocolate shortbread, enrobed in white chocolate. If you’re a wild child, the Wild Chocolate Truffles might be more your speed. The chocolate used for these is made from beans gathered from wild trees in the rainforest; they’re simply composed of that special chocolate, organic cream and a hint of sea salt. A 68% chocolate can be too dark for many bitterphobes, but you’ll find none of the usual dark chocolate bitterness in these treats. Even the marzipan is something different at GrendelSweets. When was the last time you saw anyone offering organic apricots simmered in Cognac, wrapped in marzipan and covered in chocolate? These confections tend toward the complex, but never at the expense of good taste. If you happen to be in Bellevue, Washington, drop in to Café Lento in the Lake Hills Shopping Center (156th Avenue SE). 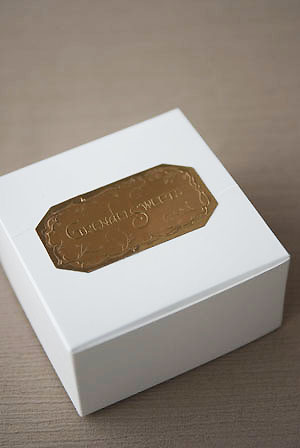 The chocolates are made there, and it’s the exclusive retail location in the Seattle area. From top, clockwise: Butter truffle, White Chocolate Truffle Cookie, Apricot Brandy Marzipan and Dark Chocolate Truffle Cookie. The only mystery is why these beautiful, delicious chocolates are named after a hideous, murderous monster, of whom nothing sweet could be said. Perhaps it’s because these chocolates are wildly different and monstrously good? Do You Love Artisan Chocolate? 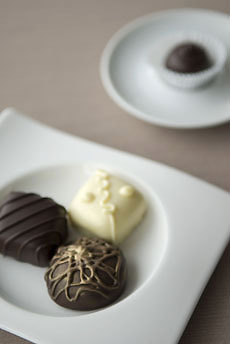 Let us know if you have a favorite chocolatier we should consider for this series. 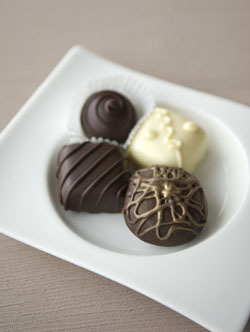 Tell us about your favorite chocolatier.